On this day in 1942, the United States and Japan met at the Battle of Midway, which would end three days later in a decisive American victory. By this time, the Americans had cracked the Japanese fleet’s codes – and not only did they know about the attack, they knew exactly where their opponents’ ships would be. 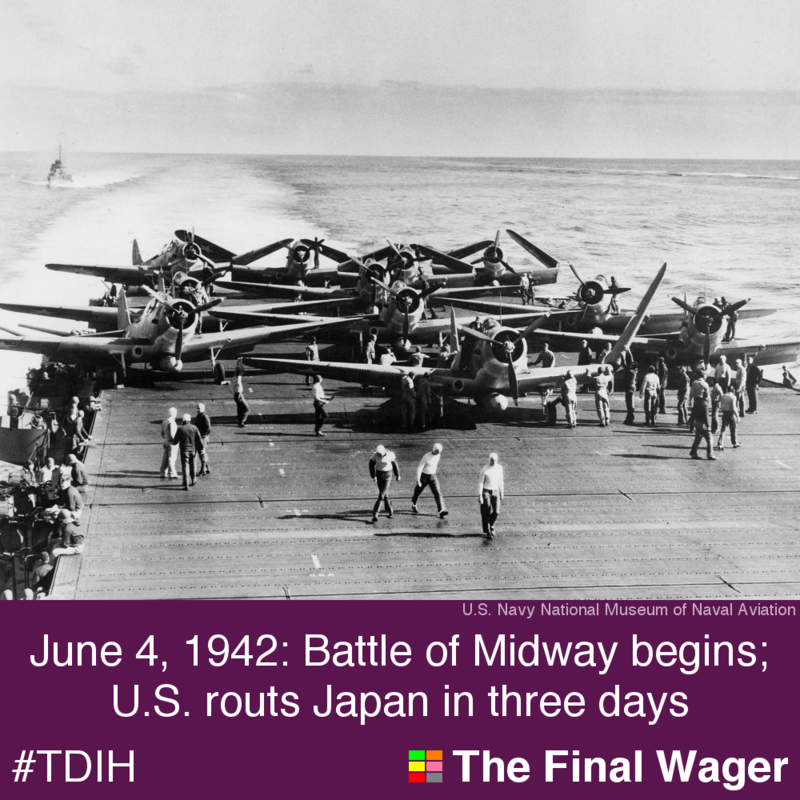 The U.S. Navy, led in the Pacific by Admiral Chester Nimitz, won a decisive victory. The Japanese forces of Admiral Yamamoto Isoroku lost four aircraft carriers, a heavily-armored cruiser, over 300 aircraft, and 5,000 seamen, as opposed to one aircraft carrier (the U.S.S. Yorktown), around 150 aircraft and 300 sailors for the American side. For a full accounting of the battle, visit History.com. To see how the 1% lived during the Great Depression, check out this Pan Am travelogue on Midway Atoll and Wake Island from the 1930s. On this day in 1942, a Japanese fleet found itself totally disoriented (sorry but I couldn’t resist) by the presence of a smaller American force at Midway. The Japanese were surprised to find three evidently hostile aircraft carriers confronting them. No doubt, the Japanese would have liked a few days to contemplate the petals of a chrysanthemum and develop a brilliant strategy in a haiku. But we Americans are always in a rush–fighting a two-front war can be hectic–so we rather brusquely sank four Japanese carriers. Apparently, Zen is not a good defense. If the Japanese were a more spontaneous people, they would not been so stupefied by the surprises of war. Did they think that they had a monopoly on surprise attacks? Admiral Yamamoto did graduate work at Harvard but apparently none at the Lampoon. Just imagine if the Japanese fleet at Midway had been commanded instead by a Groucho Marx. The Japanese could have quickly reacted and reduced the American fleet to the equivalent of Margaret Dumont. But the Japanese mind lacked that flexibility. You can’t fly by the seat of your pants when wearing a kimono.